We're stirring up something fun + festive with our blogger friend, Queen's Vein, for New Year's Eve! When we were brainstorming ideas for collabs for a New Year's Eve posts my mind immediately went to Alexa Bishop of the DIY + design blog, Queen's Vein. She has awesome style and her DIYs are SO. GOOD. If you need a little (a lot of) sparkle in your life look no further than her blog. When she came back with this sparkler cocktail stirrer idea I knew that she was gonna kill it. I wasn't wrong. Okay, I'm going to stop ranting for a second to let Alexa take over and walk you through the DIY! I’m excited to be guest posting on the Handzy Blog! The past few years on New Year's Eve, I’ve pulled out sparklers at midnight to ring in the new year. 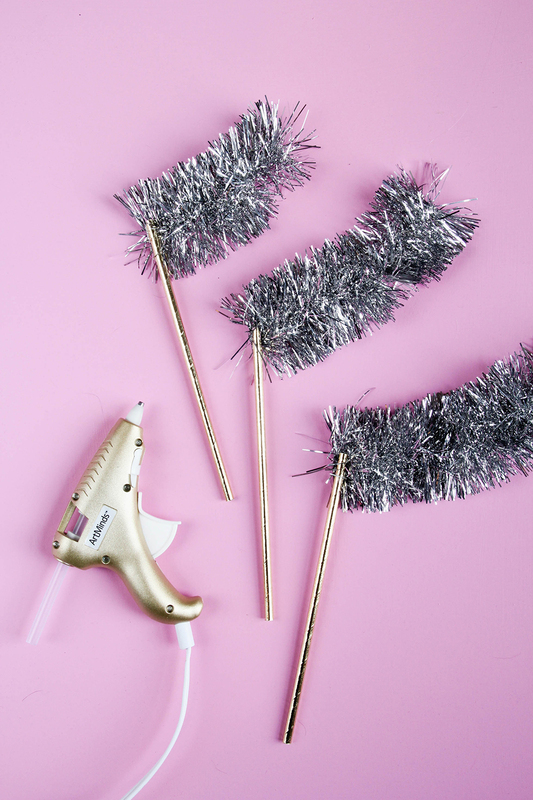 Instead, this year I’m making sparklers that can last the whole night with this fun DIY. The best part is it’s so easy and quick you can whip them up on the 31st! Cut 3-4” long pieces of tinsel garland. Hot glue one end of the garland to the end of the straw. Wrap the garland around the straw and hot glue the other end down. Champagne is the drink choice for NYE so we want to mix it up with a champagne based cocktail. The French 75 is festive and light that you will keep it flowing all night! The Handzy team created a fun printable recipe to share at your soirée. Keep out that Christmas garland and add extra sparkle to your New Year's Eve cocktails! So fun! What are some of your favorite NYE traditions? Download our cute cocktail recipe card here. This could be a good hostess gift idea too! Just print out the recipe and attach to a bottle. Remember to #handzymakes if you make any of the DIYs you see on the blog!